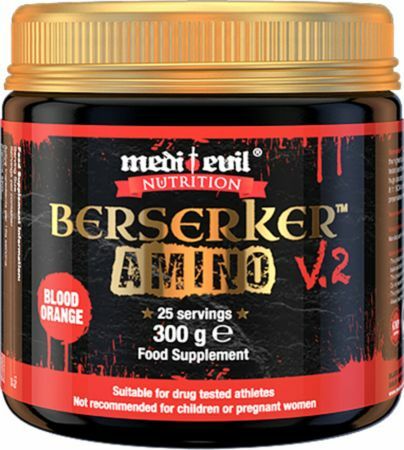 Medi Evil Berserker V2 Amino at Bodybuilding.com - Best Prices on Berserker V2 Amino! For a limited time, buy 1 Berserker V2 Amino, 300 Grams & get 1 FREE! What Is Berserker V2 Amino? Berserker V2 Amino is a state of the art Intra workout often desired by athletes and sports people who want to get the most out of their training sessions and competition. The stimulant free nature of Berserker V2 Amino allows the user to combine it with Medi-Evil Warfare advanced pre-workout for blistering results or to simply use whilst training or throughout the day. The cutting-edge formulation contains a series of high quality and research proven ingredients. Who can use Berserker V2 Amino? Berserker V2 Amino is completely designed for any athlete of any level who wants to seriously up their training or competition game. Whether you’re a cyclist, runner, cross fitter or strength athlete Berserker V2 will be your perfect training partner. Berserker contains only natural ingredients, which are of the highest quality and are suitable for all drug tested athletes and Military personnel. Branched Chain Amino Acids are made up of the amino acids Leucine, Iso-Leucine and Valine and can make up as much as 30% of human muscle tissue. BCAAs make up a significant portion of essential amino acids in the diet. Grape seed extract contains high levels of antioxidants. Magnesium has a huge number of benefits especially in an intra workout product. Energy production is made more efficient which can help with controlling levels of fatigue and tiredness. Magnesium is added to the Berserker V2 Amino Intra workout because it is an important electrolyte. BioPerin is the brand name of a very high strength piperine, which is a black pepper extract. Bioperine is used for its nutrient uptake of Bio-enhancement abilities and is especially effective in the uptake of Vitamin B6. Vitamin B6 or pyridoxine plays a huge role in the conversion of nutrients from food into energy and helps the body metabolise fats. B Vitamins generally have also been associated with healthy eyes, hair, skin and organs such as the liver. The Liver being an organ essential with fat metabolisation for energy. BCAA (8:1:1), Arginine AKG, Flavour (including Sweetener - Sucralose), Citrulline Malate, Beetroot Extract, L-Tyrosine, Taurine, Grape Seed Extract, Magnesium Oxide, Vitamin B6, Panax Ginseng, Bioperine, Vitamin B12. Allergies: Manufactured in a factory that handles gluten, nuts, dairy, yeast, soya and eggs. Directions For Berserker V2 Amino: For best results mix 1 scoop (12g) to 500ml of water. Dilute to taste. This product is a food supplement and should not be used in conjunction with food as part of a healthy and balanced diet and not as a substitute. This product is intended for adults and should be stored out of reach and sight of children. This product is not suitable for children of pregnant women. Do not exceed the recommended intake. Always read the label. BLACK KNIGHT SUPPLEMENTS LTD., Suite 36, 88-90 Halton Garden, Holborn, London, EC1N 8PG.